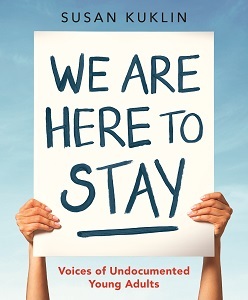 We Are Here to Stay features nine courageous young adults who have lived in the United States with a secret for much of their lives: they are not U.S. citizens. They came from Colombia, Mexico, Ghana, Independent Samoa, and Korea. They came seeking education, fleeing violence, and escaping poverty. All have heartbreaking and hopeful stories about leaving their homeland and starting a new life in America. And all are weary of living in the shadows. We Are Here to Stay is a very different book than it was intended to be when originally slated for a 2017 release. It was originally illustrated with full-color portraits of the gorgeous participants. Since the last presidential election and the attempt to repeal DACA, my publisher and I felt that it was too risky for the contributors to be identified by photographs or by name. We stopped the press and held back the book. But the participants wanted their stories told. Their stories needed to be told. With their advice and consent, we revised the book by replacing their photographs with empty frames, and their names are represented by first initials. It is my dream that one day we can republish this book with the names and images in place. I am honored to present these enlightening, honest, and brave accounts as a way to encourage an open, thoughtful, and reasonable conversation about the complexities of immigration–and the uncertain future of immigrants in America. Read an interview with Susan on Worlds of Words. Read the School Library Journal interview with Susan about the book. 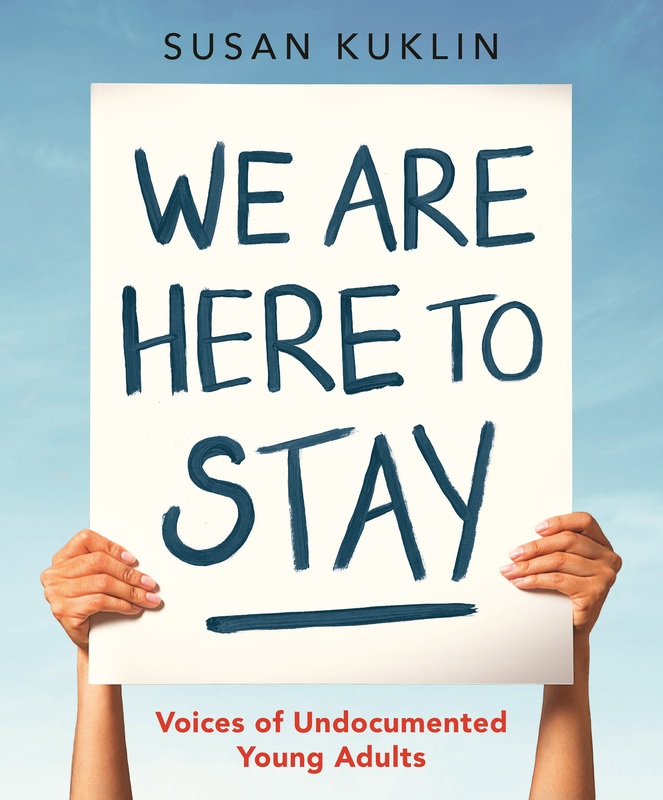 [The] author’s note and the annotated endnotes are essential to understand why there are empty frames where photos would typically appear and to consider the more difficult aspects of DACA that will affect the fates of the book’s contributors. For those who understand Kuklin and her interviewees’ intent, the visual redactions are haunting, and the subjects’ cautious but pervasive optimism is a troubling counterpoint to readers’ knowledge that the American welcome mat has subsequently been pulled out from under their feet. The following websites are useful for undocumented youths and others who are seeking immigration information. The ACLU Immigrants’ Rights Project uses targeted impact litigation, advocacy, and public outreach to protect the rights and liberties of immigrants. Atlas DIY offers a wide variety of services, such as free legal services, language classes, college preparation programs, scholarship lists, and more. Educators for Fair Consideration (E4FC) empowers undocumented young people in their pursuit of college, career and citizenship. Kids in Need of Defense (KIND) serves as the leading organization for the protection of children who enter the U.S. immigration system alone and strives to ensure that no such child appears in immigration court without representation. They achieve fundamental fairness through high-quality legal representation and by advancing the child’s best interests, safety, and well-being. The Lacy and Larkin Fund was created by Michael Lacey and Jim Larkin, cofounders of Phoenix New Times and Village Voice Media. They have dedicated settlement money arising out of their illegal arrest by Sheriff Joe Arpaio (Maricopa County, Arizona) to fund migrant rights organizations throughout Arizona. The National Immigration Law Center (NILC) is the primary advocacy organization in the United States dedicated to defending and advancing the rights and opportunities of low-income immigrants and their families. U.S. Citizenship and Immigration Services (USCIS) maintains an excellent website for learning the most up-to-date immigration law.